We have revised the requirements for fastener patterns in Corrugate. The current table in E2/AS1 is conservative at one end of the scale, and overstated at the other, and will be reviewed in line with the COP. The current Code of Practice has no simple recommendations for nail pattern requirements to houses (buildings built in the scope of NZS 3604). 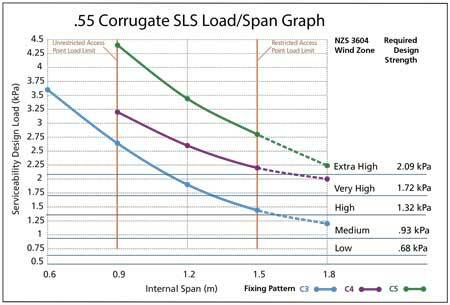 To arrive at one, you have to convert wind speed to kPa, convert this to serviceability (which it doesn’t advise you on), and refer to the Load Span graphs. On engineered buildings including houses in SED wind zones, the local pressure factors vary from 1.0, 1.5, 2.0, and 3.0 depending on their location. The COP addresses local pressure factors by saying to reduce end spans by 1/3rd. 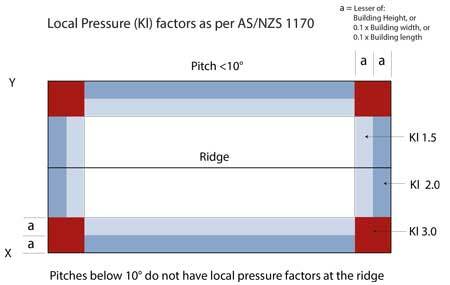 This isn’t correct, local pressure areas take up large areas of an average house roof. 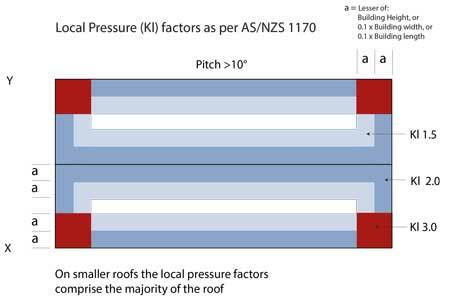 Fortunately NZS 3604 simplifies this by applying a factor of 1.5 over the entire roof. An ultimate design load is about 1 ½ times the serviceability design load. In testing we find that ultimate failure loads are about twice serviceability failure loads. Therefore if a pierce fastened profile passes a serviceability design load test for a particular design, it will easily exceed ultimate deign loads. 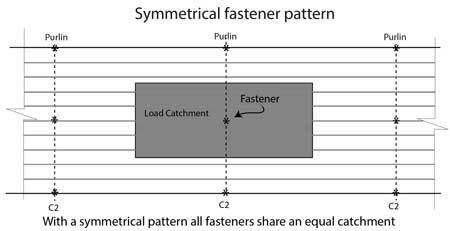 It is intuitive that if a given fastener pattern is marginal for a situation, then alternating rows with denser fastener patterns will give greater resistance. However when you observe a wind uplift test you can understand why doing such can be counter-productive. When a symmetrically fastened sheet is under uplift load, the unfastened crests bow upwards for the entire length of the sheet, the pressure being shared by the adjacent crests’ fasteners. Put a fastener into that otherwise unrestrained crest, and that fastener will be trying to resist uplift of that crest for the entire length of the sheet. 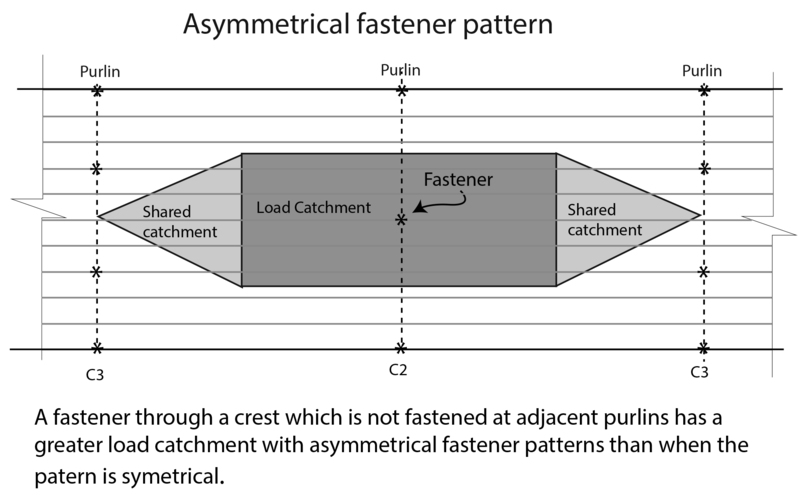 Our generic testing indicates that asymmetrical fastener patterns will provide similar load resistance than the lesser of the two patterns on its own would provide. In some cases they may even provide less. 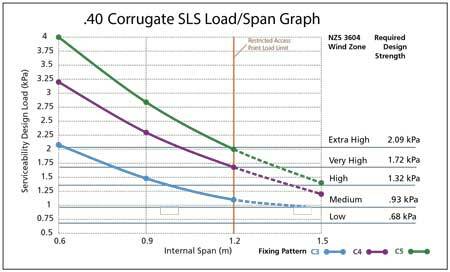 The new Load Span graphs for Corrugate are a result of new testing on spans down to 600 mm with 2-5 fasteners per sheet. coded C4, C3 will require 3 fasteners per sheet, etc. Load spreading washers are not included in the new table. Generally, if C4 fastening in .40 material will not make it, you are better going to .55 G500 material. The new fastener tables will show the relevant Wind Zone from NZS 3604, as well as the kilopascal values. That will be easier for both roof installers and compliance officers alike. Gone will be the conversion table from wind speed to pressure. The calculation used includes values for roof self-weight and internal pressure (Yes even lined houses have internal pressure). It is converted to serviceability load, so is only relevant for pierce fastened products. Otherwise, Ask the designer for the serviceability design wind loads. Why ask the designer to do it? Because calculation of wind pressures is very complicated, even the experts can arrive at some quite different calculation results for the same job. The design loads have already been calculated by an engineer and agreed by the TA prior to the consent being issued. No need to do it again. patterns should be based on a given wind speed, ask them for a roof plan giving purlin spacing and serviceability design loads. (Or ultimate loads in respect of clip fastened products.) Ultimate loads can be converted to serviceability loads (if necessary) by applying a factor of .71 in all parts of the country. For NZS 3604 designs quoting a Wind Zone, use the new nail pattern guide. Apply Serviceability loads for pierce fastened products, Ultimate loads for clip fastened profiles.